Early on in the series we created our first Creative Mode and Survival Mode maps, but then we dove headlong into learning about biomes, creatures, and many other facets of the Minecraft experience. Today we’re returning to the map. Let’s learn how to seed and generate awesome custom maps. In our earlier lessons we simply had you create a world by allowing Minecraft to randomly generate one for you. While there’s nothing wrong with this approach, you can easily take control of the creation process and direct it so that the world contains the features you desire. While the individual blocks might be the most fundamental component of the Minecraft experience the way those blocks come together into the greater world map is what shapes your play experience. In Creative Mode players are inspired by the landscape: the sweeping mountains of the Extreme Hills biome become the foundation of a magnificent castle, forests give rise to logging camps, careful terraforming of a Desert Village creates an oasis right out of an Arabian tale. In Survival Mode those same biomes present challenges and rewards all their own. Rolling the dice with the world generator is fun but you’re not stuck with dice-roll worlds. Using just the tools built into Minecraft you can exert a fair amount of control over what kind of world the in-game generation engine will create. Let’s look at how we can use seeds and presets to create the world we desire. The first way you can direct the world creation process is by the use of map “seeds.” Whether you use the in-game tool to specify what you want your seed to be or let the game pick a seed for you, every map has a seed code. In fact, as an interesting aside, even without sharing a seed two people could have the same world is by some chance they happened to have perfectly synchronized computer system clocks and they went to create a new world at exactly the same millisecond in time. Minecraft uses the time provided by your computer’s system clock to seed the world if you don’t provide a seed of your own. This is why you can create world after world after world without running into a duplicate one (because the time stamp for the creation of each world is different). Although the pool of worlds seems nearly infinite, technically speaking the limitations of the seed length and the generation algorithm limit the total possible worlds to 2^64 power (or 18,446,744,073,709,551,616). Not truly infinite but so big we’ll never have to worry about running out of fresh worlds. Any other player who creates a world with the corresponding version of Minecraft and uses that seed will have the exact same world we’re standing in: caves, villages, dirt and all. Let’s take a moment to emphasize that “corresponding version” bit. 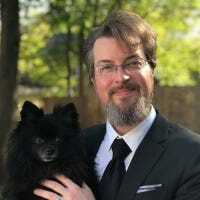 Major releases of Minecraft typically include changes to the world generation engine and while all seeds will always work (in that they will generate a world) they won’t generate the same world unless the versions use the same world generation algorithm. You can share seeds between Minecraft 1.6.2 and 1.6.4, for example, and typically get identical or nearly identical results, but a seed that produced a cool mega village in 1.6.2 likely won’t produce anything like that if you reuse it for 1.7.9. Using the seed system allows you to share a seed with your friend so that they can enjoy it and in turn they can share seeds with you. Further, it allows you to easily search on the Internet for seeds that interest you. Simply searching for your Minecraft version number, the term “seed,” and the features you want, typically yields a pile of seeds. Searching for “Minecraft 1.7 exposed Stronghold” for example (because we wanted a map with a Stronghold near the surface and ready to explore), yielded multiple results all indicating that using the simple seed “4” on Minecraft version 1.7.x would provide all the Stronghold goodness we crave. So how do we apply a seed? 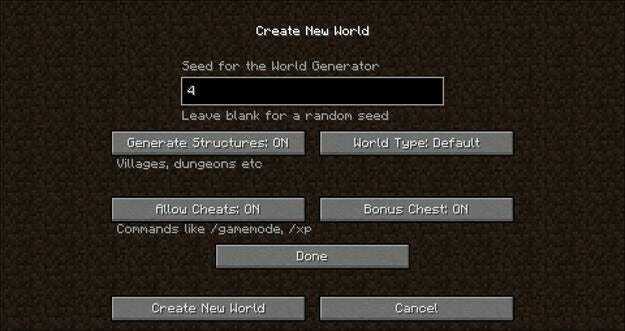 In the “Seed for the World Generator” box, you place your seed. Although the automatically generated seeds are long integer strings, they don’t have to be long numeric strings. You could type in “I love diamonds” or “Notch is a creative genius” and the world creator would just convert the alpha strings to an integer. This conversion is why even if you type “I love diamonds” when you later use the “/seed” command to give the seed to a friend, gives an integer instead of an alphanumeric phrase. That’s the beauty of the seed system right there. One person can discover a cool seed and can then turn around and do a “seed spotlight” video on YouTube, post pictures of the seed on the Minecraft forum, or otherwise share it far and wide. When searching for seeds with specific features, the general search terms we highlighted above – Minecraft version + seed + features you want – works very well. If you’re more in the mood for simply browsing what’s out there, we recommend The Official Minecraft Forum’s Seed Sub-forum. While seeds are like the DNA of a map, presets are like genetic expression: a gentle nudge in a given direction. This is the most basic of the “Superflat” words. 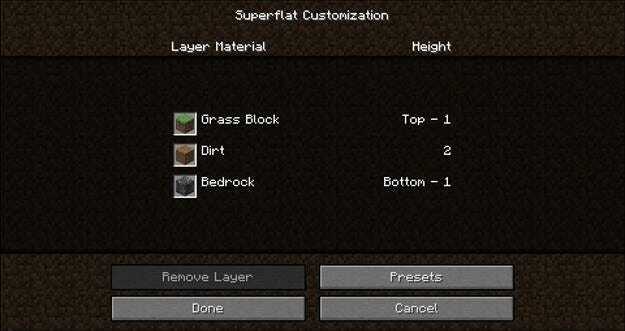 You get a layer of grass, two layers of dirt, and then you hit bedrock. It pretty much exists to provide a flat surface for Creative Mode builders to work on (it would be a horrible survival map to suffer through). Let’s click the “Presets” button and see what we can do to mix things up a bit. In the preset menu, you’ll see the preset code string for the Classic Flat configuration we saw laid out on the last screen. The preset code can be simple as seen here, with just a dozen characters or so, or it can be extremely complex with hundreds of characters covering multiple variables. You could have the setup you desire. 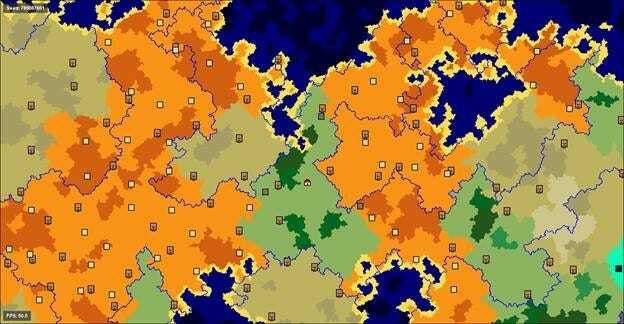 The first number specifies the version code (so you can share preset codes across changes in the generator code), the next numbers specify the layers of world (1 bedrock, 60 stone, and 6 sand), and then the remaining variables specify how big and far apart the villages will be, what the biome is (and how far apart its features are), and that we want the decorations turned on, e.g. there will be cacti in the desert. Presets are probably one of the most underutilized features in Minecraft as most players look at the menu, try out the basic Superflat plains world, and then shrug and go “Ehh, lame,” before promptly forgetting all about it. There’s a ton of potential hidden in the variable system however, and we’d strongly encourage you to check out the Minecraft wiki entry on the preset variables and to experiment with this handy visual preset generator, courtesy of Minecraft101. Using that generator is radically easier than parsing out the codes by hand and gives you the opportunity to mess around with really fun combinations like superflat worlds that have cake in the middle (you’ll never go hungry again), worlds that are 200 layers of stone instead of the typical 65 or so (you’ll be mining forever), and if you really want to mess with the game mechanics. You can even do stuff like create a super flat world with just a layer of bedrock and grass but turn on structures like Abandoned Mineshafts! Before we leave the world creation screen, there are two other options worth examining. 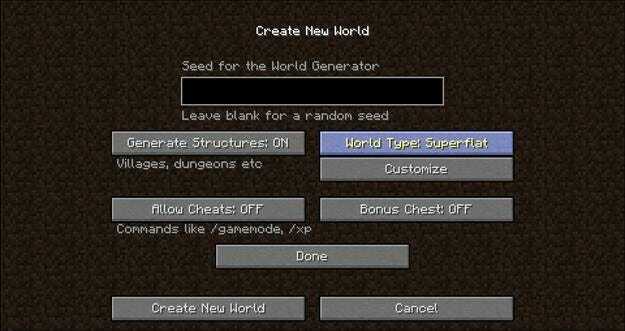 When you click on the “World Type” button in the world creation screen, your options are Default, Superflat, Large Biome, and Amplified. 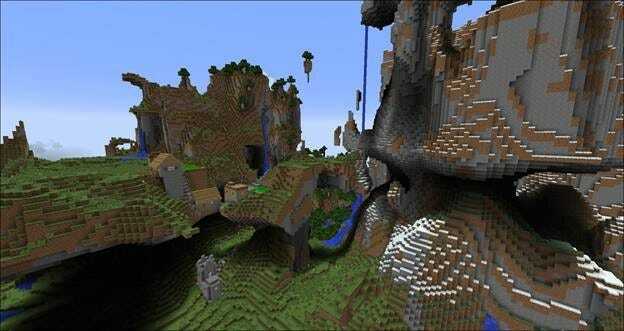 The two latter types, Large Biome and Amplified offer us some pretty cool variations on the standard map. Large Biome maps are maps that follow the same biome pattern as their default counterparts except that the biomes themselves are 16 times bigger. If you find it puzzling that a thin strip of snowy hills can exist between two swathes of desert, this is the biome for you. That thin strip of snow will become an expanse and the transition between biomes will seem significantly less dramatic. Here is a world created using the Default algorithm on Minecraft 1.7.9 and the seed 785087661. 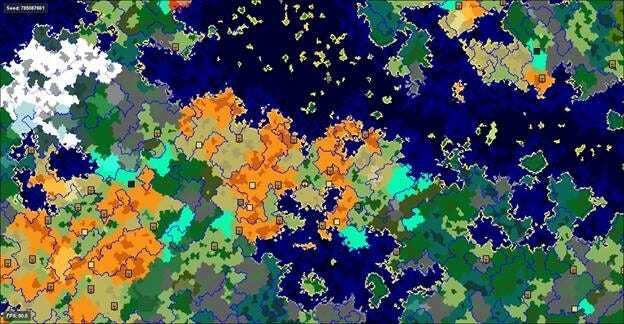 Here is the same seed, again in Minecraft 1.7.9, but with the Large Biomes algorithm enabled. You’ll notice two things about the Large Biome map. First, it’s like zooming in on the original map with a 16x magnifying glass – what took up a small portion of the map (the grasslands and deserts) now takes up the entire viewable area in our map reader. 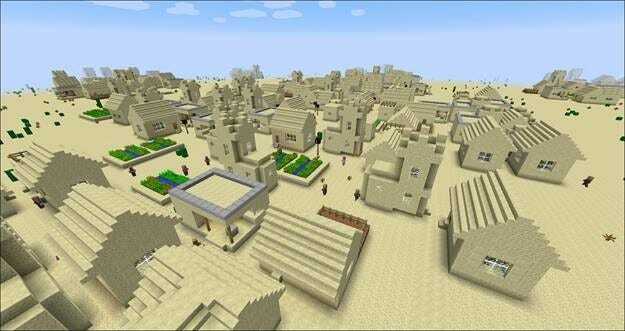 Second, you’ll also notice the explosion of Villages and Desert Temples. Because the biomes are 16 times bigger, there is 16 times the space for the game to apply the structure generation algorithms to applicable biomes. Huge biomes mean lots of room for structures. In addition to the expansive biomes offered by the Large Biome algorithm there’s another larger-than-life algorithm you can take advantage of: the Amplified map. Amplified maps were actually created by accident. Jeb, one of Minecraft’s lead developers, was messing around with generating worlds where the terrain was so extreme in elevation that it broken through the clouds and pushed into the sky. The resulting generation algorithm was rather extreme, a bit glitchy, and yielded odd results like huge hunks of rock floating in the sky like islands and villages spawned in odd locations. The results were so novel, however, that Notch insisted the algorithm be included in the game. You can see extreme elevation changes on both sides of the map; extremely tall rock formations, floating islands of stone and dirt (some even have trees and grass), and the most curious thing of all: the village. In a normal map you’d never find a village spawned falling off the edge of an Extreme Hills biome like that, but such odd village placement is common in Amplified maps. Even when you’re not running across oddly shaped villages, you’ll never out of soaring terrain to explore. 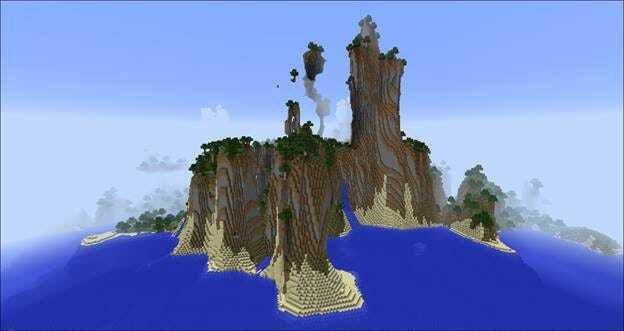 The screenshot above is from the same Amplified map, taken from above an Ocean biome in order to give a clear view of how extreme even the shorelines are on an Amplified map. Whether you’re looking to build a wizard tower above the clouds or set up a cliff diving deck it’s an extreme adventure paradise! Creating worlds of your own using the generation tool or looking up awesome seeds other players have shared is a great way to expand your map palette, and exert a little control over what your maps look like. There’s one major thing that the tools we reviewed today won’t do. No seed or generator tweak is going to build custom terrain or structures that don’t already exist in the Minecraft generation algorithms. No amount of seed hunting or Superflat generator tweaking will ever yield anything that looks like say, an Ewok village from the Star Wars universe because there’s simply nothing in the game code that would ever spawn villagers homes up in the trees of a Roofed Forest biome. Other players, however, go nuts building cool worlds like that filled with awesome structures. Tomorrow we’re going to look at how to download and install custom maps created by other players so that not only do we get a cool map (like we do with seeds) but we get all the cool stuff the player has built in that world too. For homework, play around with the world generators, especially with the Superflat generator and the website we linked to. 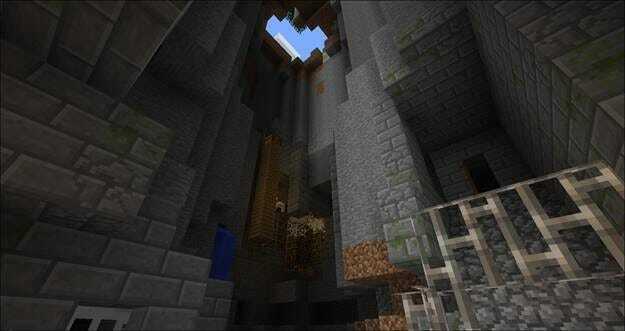 We’d recommend you save the Amplified maps for last, it’s almost impossible to resist exploring them.